Here’s a scenario that’s familiar to just about everyone: you log into your email account, only to find your inbox flooded with promotional emails from various businesses. You’re simply not interested in any of the brands, products, or offers you see, so you immediately start deleting the emails—often without even opening them. It’s partly due to unsatisfactory email open rates that lots of automotive dealers have turned to other channels—such as social media and content marketing—to communicate with customers. These newer digital tactics often yield great results for businesses, but the truth is that email as a communication channel was never the real problem. In fact, the challenges of email marketing have a lot more to do with the relevance of the content businesses send to customers. If businesses could better tailor messages to individual needs, customers would have a much greater incentive to pay attention to them. A recent survey1 reported by eMarketer supports this logic, finding that among the types of email most likely to bring U.S. car shoppers to a dealership, email that is personalized to align with customers’ interests is most compelling. Survey respondents assigned highest preference to email that “includes information about car model, style, or color you’re interested in” (28 percent), followed closely by email that “speaks to interests or needs” (23 percent). On the other hand, respondents saw little value in email that “includes salesperson’s name, email and phone number” (4 percent)—which, of course, is readily available information that likely has minimal personal relevance for the customer. In other words, survey data confirms what you already know intuitively from your own experiences: consumers are losing tolerance for one-size-fits-all communications. And it’s no wonder. Most of us have grown highly accustomed to social media algorithms and smart device interfaces that can detect patterns in the topics we’re interested in—then serve them back to us in an endless feed of content engineered for our specific preferences. On top of that, TV is no longer the primary screen for many consumers, who now spend far more time on laptops, tablets, and smartphones consuming content across many platforms. How can a generic marketing email compete with that? It can’t, of course, and that’s precisely the point. At Search Optics, we’ve seen the beginning of a pronounced shift in digital marketing that aims to move beyond traditional approaches to engaging audiences and measuring reach. For example, impressions—an estimate of the number of users who have the opportunity to see an ad—long served as a predominant means of evaluating the success of digital marketing campaigns. Recently, however, the industry has begun to recognize that campaign effectiveness may have less to do with getting a message in front of as many people as possible than with getting it in front of the right people. That’s why the digital marketing industry has begun to emphasize data as the future of digital marketing, and Search Optics is leading the way. 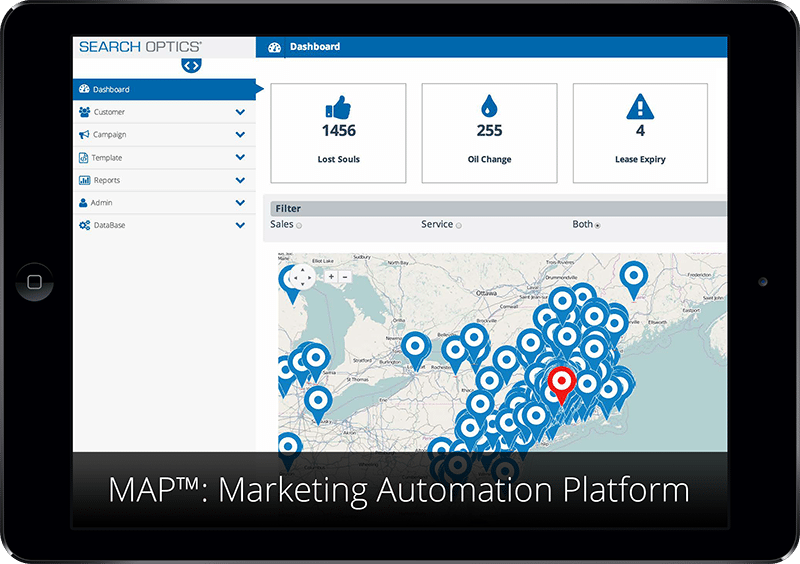 Our Marketing Automation Platform (MAP), which launches this month, is poised to revolutionize the way automotive dealers approach email marketing. MAP delivers microtargeted communications to customers by analyzing a wealth of data—data most automotive dealers already have but couldn’t leverage to its fullest potential until now. The result is customized email and direct mail campaigns precisely tailored to your customers’ needs. We believe both your business and your customers will benefit from this new perspective on communication. Just think about it: if all of the promotional emails in your inbox spoke to a specific, personalized need or interest, you’d probably open a lot more of them. Your customers feel the same way. We’ll provide an in-depth exploration of MAP’s capabilities and benefits in a follow-up post. For an overview of how your dealership can leverage MAP to build data-driven, customized campaigns, click here.